A mysterious image of an unknown red Nokia Lumia with Nokia’s Pro Cam installed and AT&T’s logo on top has just leaked from @evleaks. The leaker wonders whether this is “a dream or …. ?” on Twitter, but on its Chinese microblogging account he asserts that the image is indeed of the red Lumia 1020. So far, Nokia’s 41-megapixel camera superphone, the Lumia 1020, has only been made available in black, yellow and white. 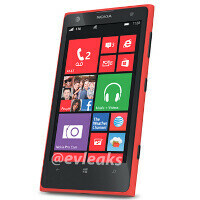 The other colors Nokia is known for like cyan and red have been weirdly missing so far. If this is indeed an image of a Lumia 1020, Nokia might have just wanted to space out the launch of different color versions as a marketing strategy. What do you think the mysterious red device is? The biggest mistake that Nokia did to this phone is pricing this too high for last year specs. Lumia 1020 should have next gen WP specs. I'm sick and tired from so called specs!!! If your phone runs well and suits you, why you should care about specs? Resolution of the screen - Apple start this stupid Retina display, that is completly useless. Then smartphones became with full HD resolution on 5" screen?!? For what??? To drain battery and need quad or octa cores in CPU? Can you see the dots on your screen on 200 ppi? Yes, you can but....with spy glass! Exactly. The way I see it, 1020 is the best phone on the market. 925, with its "last year specs" actually performs more smoothly than S4 and One and this one has double the RAM. I bet you that these folks in the Windows camp never played the coolest high graphic games like Real Racing 3 and Asphalt 7. Biggest joke is that these games are not even available to the Windows. Not true at all! Wp8 don't lag at all. Android lags just flipping through home screens! Of course these games will never match consoles or PCs. You completely missed the point. I actually have both of those games on my Lumia 920. They both run lag free. I think it is hilarious that you guys are trying to make a point about WP8 not having high end games by naming 2 high end games that actually are on WP8. Wrong! We got asphalt 7! And that's why I have a Xbox for. $660 unlocked is not expensive; when 808 PureView was launched last year, the price was around $600. When Lumia 920 was launched last year, it was $650. I don't see why they'd price 1020 over 920 (299 vs 99) if the off-contract price is same. Probably because they are still selling 920 on at&t and don't want to discontinue it. How much it costs on carrier depends on how much the carrier is willing to subsidize it. But from the off-contract price it is definitely not expensive, and i think Nokia doesnt want to cannibalize the sales of the 920. I agree that phone with last year's spec should not be priced high. BUT.. The Lumia 1020 has PREMIUM Camera that No other OEM has. That alone should justify its price. Also, aside from the processor, the Lumia 920 also has some of the last years high end specs including Hyper sensitive screen, Rich audio recording and Wireless Charging. And be patient, a version of the Lumia 1020 with next gen WP specs will be available as soon as Microsoft do their homework. It's not Nokia's fault that WP hasn't supported Quadcore Proc yet. It does look like Nokia is switching back to matte with 1020. White, black and yellow are. My friend has a red L920 and it's definitely a looker. Cyan should have been the color instead of yellow. Yellow is the new cyan.